Many people want to grow their own cherries— predominantly sweet cherries. Where rain during harvest is a problem, always chose a crack resistant variety, but where it is drier during harvest most sweet cherry varieties will produce excellent fruit. Cherries are one of the most popular seasonal fruits in the grocery store, and many people want to grow their own. There are many challenges to growing cherries, and not everyone will be successful. There are several limiting factors that the potential backyard orchardist should consider before planting cherries. Most of them are factors that Mother Nature has control over. Hardiness Zone: In general tart cherries are more winter hardy than sweet cherries, and will take colder winter temperatures than sweet cherries. For the most part, sweet cherries are only winter hardy into Zone 5, although a few varieties will tolerate some Zone 4 temperatures. The major tart cherry varieties that Grandpa sells are usually tolerant into Zone 4. There are some types of bush tart cherries that will tolerate even Zone 3 or even colder temperatures, but we do not offer any bush types. Pollination and Frost: Early frost is one of the chief deterrents to successful cherry production. If you live in an area that has lots of early frosts, then growing cherries (or apricots or plums) can be a real challenge. You will need to think about methods of frost protection, otherwise “Jack Frost” will nip the tender blooms before they open or during bloom time. 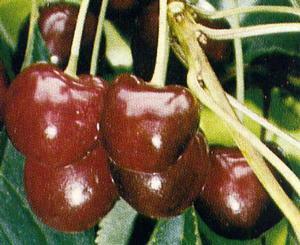 Most tart cherries are self-fertile, so they will usually set fruit if only a single tree of the same variety is grown. Montmorency is the most common tart, pie cherry and it is very productive, but blooms quite early and can be frosted easily. Balaton, Danube and Jubileum are tart cherries which may bloom a little later, but although self-fertile will benefit by having other cherry varieties close by to supply pollen. Northstar, Meteor, Super-Mont, and Sure-Fire are tart cherries that are similar in fruit to Montmorency, but have other characteristics that make them better for colder climates— often later bloom times. Sweet cherries come in two classes for pollination purposes. There are self-fertile varieties like BlackGold, WhiteGold, Stella, Lapins, and several other varieties that will pollinate themselves. They make good pollen sources for the other class of sweet cherry varieties that require pollinators. When choosing varieties, Grandpa often suggests planting a self-fertile variety as a companion for a variety you may have chosen that requires a pollinator. Because cherry pollen has a short viable range, there is quite a range of bloom times for cherry. Grandpa suggests you visit the cherry pollination charts on the “Growing Tips” page when choosing varieties so that you can try to pick varieties that will be compatible. Most sweet cherries bloom about as early as tart cherries, so expect the same frost issues. Disease Pressure: Cherry trees are susceptible to many diseases. For sweet cherry in humid climates, it is bacterial canker. This disease infects open wounds and pruning cuts, so one of the best preventions is to wait until late spring to do any pruning, and then do it when you expect a several day period of dry, warm temperatures so that the wounds get a good head start in healing. There are fungicidal sprays, like copper compounds, which help control the start of the disease also. Both sweet cherry and tart cherry are susceptible to cherry leaf spot which infects the leaves and leads to premature leaf drop. Sprays are about the best control. Retaining your leaves as long as possible through the summer helps to keep the tree strong and healthy. Brown rot is another prevalent disease, especially if you have humid, rainy damp weather that causes fruit to crack and clusters of cherries to not dry out rapidly after rains. Fungicides are the best control. Remember, when using chemicals— ALWAYS FOLLOW LABEL DIRECTIONS! Birds and Insects: Birds are the bitter enemy of successful sweet cherry production. It seems as soon as the cherry even starts to have a little color, birds start pecking at them! Netting is one helpful deterrent. Scarecrows and noise makers might help. But, birds often will eat your crop before you know it! Because cherries ripen so early in the season, there are fewer problems and insect damage than longer season fruits like apples and peaches. However, a new insect enemy, the Spotted Wing Drosophila or fruit fly, has entered the country and is rapidly expanding its range all over the US. Colder areas may have fewer problems with it because it may not always have hatched when cherries are ripening, but there is much for researchers and growers to learn about it. The damage they do is hardly visible, but when fruits start to shrivel and rot, open some up and look for larvae. Preventative spraying is likely the best control if SWD is prevalent in your area. Tart cherries, like Montmorency, are also susceptible to cherry fruit fly infestation. In many cases, only an expert can tell the difference, but their damage may be very similar and controls probably are too. Sweet or Sour: This is just about the only factor that you have control over entirely and that Mother Nature doesn’t have total control over. If you want cherries to eat out of hand, then sweet cherry is probably your main choice. For pie cherries, tart cherries are the typical preference. Sweet cherries tend to be more prone to diseases and rain cracking and less hardy in general. Tart cherries don’t often crack and are hardier in general. For a possible compromise, look at Jubileum, Danube and Balaton “tart” cherry as they have some of the characteristics of both.